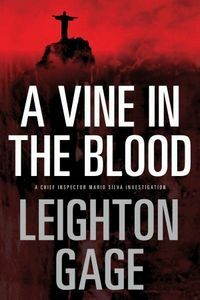 A Vine in the Blood by Leighton Gage: Synopsis and Online Purchase Options. Synopsis (from the publisher): It is the eve of the FIFA World Cup, the globe's premier sporting event. The host country is Brazil. A victory for the home team is inextricably linked to the skills of the country's principal striker, Tico "The Artist" Santos, the greatest player in the history of the sport. All the politicians in Brasilia, from the President of the Republic on down, have their seats squared-away for the finale, when they hope to see Argentina, Brazil's bitterest rival, humbled by the Brazilian eleven. But then, just three weeks before the first game, Juraci Santos, Tico's mother, is kidnapped. The star is distraught. The public is appalled. The politicians are outraged. And the pressure is on Chief Inspector Mario Silva to get her back. Suspects aren't lacking. Among them, are a cabal of Argentineans, suspected of having spirited the lady away to put Tico off his game, the star's gold-digging, top-model girlfriend, whom his mother dislikes and has been trying to get out of his life, his principal rival, who wants to play in the World Cup in Tico's place, and the man whose leg Tico broke during a match, thereby destroying his career. In the end, Silva and his crew discover that the solution to the mystery is less complex — but entirely unexpected.